[excerpted from The Presbyterian, 97.4 (27 January 1927): 17, 27. 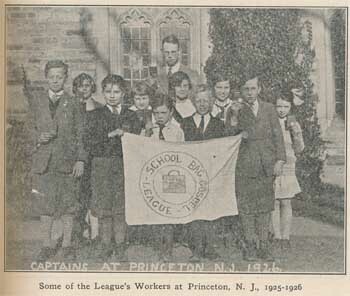 In 1925, the son of Princeton professor Geerhardus Vos, Johannes G. Vos, enrolled at the Princeton Theological Seminary, graduating there in 1928. He continued his preparation for the ministry with a year at the Reformed Presbyterian Theological Seminary in Pittsburgh, 1928-1929. Some of his classmates included Loraine Boettner, Wick Broomall, Jr., David Freeman, and Paul Woolley. But with good indication of both his ministerial aptitude and his scholastic ability, on top of his school work, Johannes was actively engaged in evangelistic ministry. Here in this article from 1927, we read of the child evangelism work that he was involved with. In the first photo shown below, Johannes Vos can be seen standing behind the gathered children. The School Bag Gospel League is a spiritual movement with a spiritual end. Its aim is the salvation of America’s boys and girls, by placing in their hands the sacred Scriptures which are able to make wise unto salvation. It distributes free of charge to school children from nine to seventeen years of age, Gospels and Testaments under a simple membership plan. The work is dependent on the voluntary offerings of the Lord’s people for its support. It originated in the Autumn of 1922, in New York City. Since that time it has spread to 210 centers in thirty-four States and the Dominion of Canada. No appeals for money are made. Many thousands of Gospels and Testaments have been issued, and hundreds of conversions have been reported. Where possible, the work of Scripture distribution is followed up by evangelistic services and Bible study classes. A few reports from different centers of the League will show the progress of the work. From the League secretary at Indiana, Pa.: “I have about 600 members altogether, and have given out about 300 Testaments. There have been 29 children who have accepted Christ as their Saviour…. In one New Jersey public school, in a rural section, seventy-five children completed the reading of the four Gospels and received Testaments. The principal of the school was deeply and favorably impressed… In another New Jersey community, where about half of the children in the school are foreign and many of them Roman Catholic, two boys enrolled about forty members and issued Testaments to thirty-five who completed the reading of the four Gospels. 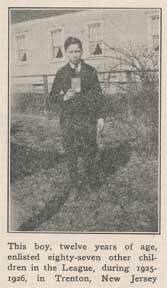 A dozen or more of these accepted Christ as their personal Saviour at an outdoor evangelistic service held by the League in the summer of 1925. For young and old, the gospel is the power of God unto salvation. This gospel is contained in the Holy Scriptures. What a precious treasure Christ has committed to His Church! Surely God’s people should ever be eager to spread the glad news to young and old that Christ’s kingdom may be extended and His people united to Him. The children of America are eager for the gospel. They are ready to receive it. When it is presented to them in its simplicity and fullness, it bears its precious fruit. God has set before His people an open door, and (for the time being, at least) no man can shut it. How long the door will remain open, no one can predict. The people of God must come to realize their responsibility to place God’s Word in the hands of the multitudes of un-evangelized American youth. “It is not the will of your Father which is in heaven that one of these little ones should perish” (Matt. 18: 14). Can it conceivably be God’s will that many millions of children in our country should grow to maturity without God, without the Saviour, without the Bible? Can it be His will that His people should be too busy with other things to give these little ones the bread of life? The School-Bag Gospel League plan is a new thing, and for that very reason many hesitate to adopt it. Consider, however, that the old plans and methods are not meeting the need. It is a rare Sabbath-school that has more children than it had twenty years ago, unless it be a new school. It is a rare church that has as many children in attendance at the services of the Lord’s house as it had twenty years ago. Meantime, millions of American children are growing up without the gospel. The easy thing is to be satisfied with the old methods, to do the old things in the old way. But, remember, that sometimes the hard thing is the thing God would have us do; sometimes the new thing is the thing God has raised up to meet the need of His kingdom; sometimes the man who receives God’s richest blessings is the one who is not afraid to take up a new thing. Consider also that this movement has upon it the seal of four years of divine blessing. If God were not in it, how could it spread as it has, making no appeals for funds? Further information about the School Bag Gospel League is difficult to find. There was a book authored by Thomas Mitchell Chalmers, The School Bag Gospel League : What It Is, which consisted of three articles or chapters. The Reformed Presbyterian Theological Seminary has the only copy that I could locate. The author, Thomas M. Chalmers was connected with an evangelistic work called the Jewish Missionary and served as editor of that work’s magazine. As to what became of this ministry, perhaps it was a victim of the Great Depression. We simply don’t know at this point. Johannes G. Vos [1903-1983] completed his additional training at RPTS and became a minister in the Reformed Presbyterian Church of North America, pastoring a congregation in Kansas and for many years producing a magazine called The Blue Banner. More recently, articles from The Blue Banner were extracted and published as a commentary on the Westminster Larger Catechism. For more on the life and ministry of Johannes G. Vos, click here. “From a child thou hast known the Holy Scriptures, which are able to make thee wise unto salvation through faith which is in Christ Jesus.”—I Timothy 3:15.